First, if you have never been to the NAAM, you must go. It is wonderful. Magnificent M introduced me to it, and it's so good. Awsume, fresh, filling food for a reasonable price, open 24 hours, live music - the've got it all. But they are nearly always busy - so be prepared to wait in line and to cozy up to the guy reading the paper at the table next to you. One of their signatures is their miso gravy (served with sesame fries, but also on many of their dragon bowls). First, brown rice. A pile of it. In the middle of the plate. Then, I put lightly blanched (VERY LIGHTLY, barely cooked) broccoli on top of the rice. Then, marinated and sauteed tofu and sauteed mushrooms. 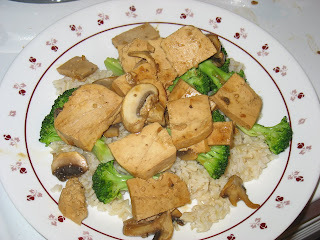 I just marinated (well, my wonderful husband did) the tofu in tamari sauce and garlic. Then, dumped it into a frying pan with some olive oil and added the sliced mushrooms. Put a pile of this garlicy goodness on top of the rice. 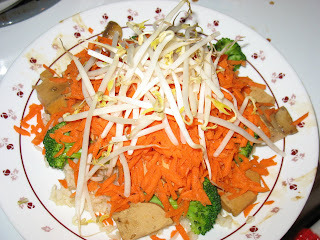 Like this: Then, I put a pile of the carrots D. had grated on top of this, and topped it with bean sprouts. At this point it's really starting to look like NAAM quality dragon-bowl yumminess. Top it off with some of the NAAM miso gravy heated up, and it was SOOOOO good. And pretty darn healthy. And stinking fililing too!! Yum. Posted by T. at 8:40 p.m.
sounds so good! I've heard of the Naam, but I've never been. I will have to try out both! you have never been to the Naam. 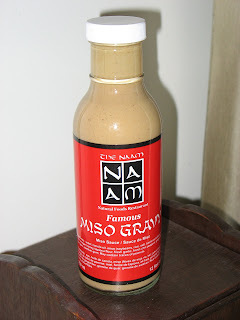 Miso gravy is so much better than "real" gravy! I've never tried it from scratch- but I love the idea. Maybe I'll try it. If you get to it before me, pass the recipe on please. That's what I was thinking! I felt like anything I made wouldn't match it :). Hogan interactive shoes are designed keeping in mind Tiger Shoes medical issues like painful joints and injuries to knees and back. The shoes are made comfortable but not monotonous; Beats By Dr Dre one will always find elegance in Interactive Hogan shoes. Weather it be plain leather shoes available in brown, Hogan Scarpe gray and blue or the latest Interactive Hogan suede brown with light blue and gray shades.